At first I thought that everything is wrong with Interlude or perhaps it is that nothing is right. Douglas Sirk told John Halliday that it was the film in which he had little chance to develop the project or contribute to the script and none of the characters excited him. It was supposed to be an update of a John Stahl film and more surprisingly a version of the James Cain story Serenade. When the shoot began Sirk was still in a plaster cast after his accident on the Battle Hymn shoot and he had no time to research locations which were all covered by an assistant and the cinematographer Bill Daniels. An American woman from Philadelphia, Helen (June Allyson), arrives in Munich to work for the American ‘cultural agency’, America House (which I think is a government body). She claims to be looking for experiences and trying to see something of the world. Her parents have discovered that an American doctor, Morley (Keith Andes), the son of friends, is also in the city. 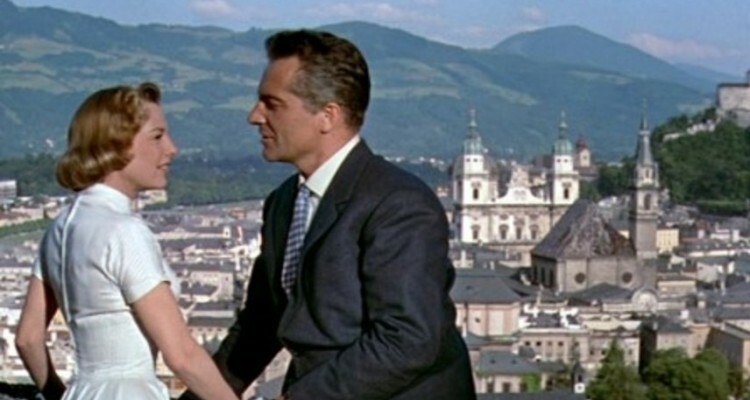 He calls on Helen but she soon meets a famous Italian conductor, Tonio Fischer (Rossano Brazzi). She is unaware that he has a sick wife and accepts his invitation to suddenly drive to Salzburg in the middle of a grand house party. A romance ensues. A familiar Sirkian shot through the windscreen? June Allyson was nearly 40 when she made the picture but the character seems to be written much younger. Allyson plays younger but she just doesn’t seem right for the role. Brazzi however does seem right for his role, except that, as Sirk points out, he has no sense of musical timing which caused headaches for the crew when he is seen conducting the orchestra. I don’t mean to criticise either actor but in June Allyson’s case her character doesn’t seem to make sense unless she is a woman who is younger and less experienced. Otherwise we keep thinking, “What did she do in Philadelphia/Washington DC for the last twenty years?” Jane Wyman was only a year or two older than Allyson when she starred for Sirk in roles which suited her – perhaps this is just a function of the period in that women are the same age for twenty years then suddenly ‘past it’? Helen calls herself ‘a girl’ at one point. I should also point out that Keith Andes’ doctor is also fairly long in the tooth for a visiting ‘research student’. The script by Daniel Fuchs and Franklin Coen seems confused. 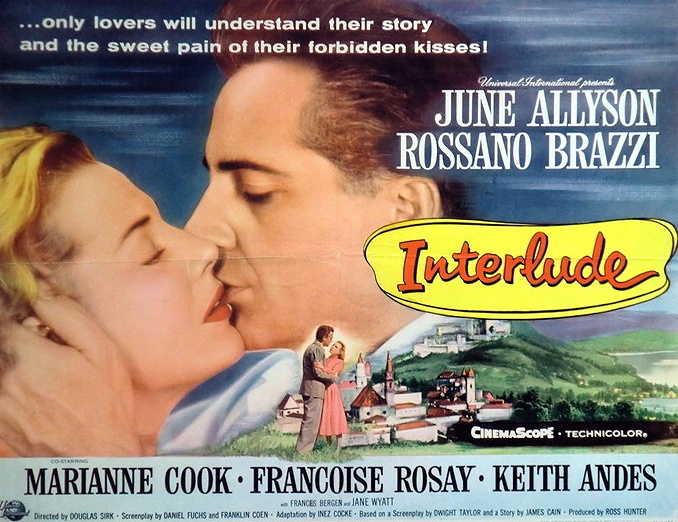 Interlude is a Ross Hunter production in CinemaScope and Technicolor and it takes Sirk back to Germany and in a sense to Schlussakkord (Germany 1936) a Sirk melodrama with a great conductor as the male lead. Yet somehow it feels more like those 1950s Hollywood films in which Europe is at once both the ‘old world’, full of palaces and grand houses to be admired but also the front line in the Cold War with attempts to demonstrate to Europeans the ideals of American democracy. (‘America House’, like the British Council, is an agency meant to provide education and an introduction to American culture.) On the other hand, the cinematography creates not just beautiful vistas but also very pleasing ‘Scope compositions for a melodrama – with matching music (but an unconvincing title song). At moments it seems like a rehearsal for The Sound of Music (1965). The second half of the film did work for me and I found it both sad and moving, so I guess it wasn’t as bad as I thought it might be. I should mention two other aspects of the casting. The sick wife Reni is played by Marianne Koch (credited as ‘Marianne Cook’) who I first came across in A Fistful of Dollars (1964) as the German contribution to Sergio Leone’s first film in the trilogy of ‘No Name’ Westerns. Her aunt is played by Françoise Rosay, the veteran French actor who fled Nazi Occupation in 1940 with her husband Jacques Feyder. She appeared in two Ealing films in 1944. Her appearance in 1957 is as a formidable matronly figure from the Victorian era (she was born in 1891). These casting decisions alongside the Italian Brazzi seem to say something about the state of popular cinema in West Germany in the 1950s. I’m trying to come to some kind of conclusion about this film. From the perspective of 2019 this melodrama does seem rather strange with Tonio’s sometimes quite brusque treatment of Helen and the latter’s difficulty in coming to terms with a sick woman as her rival. I’m wondering if women now would be more likely to react to Tonio’s behaviour and also more direct in dealing with what they discover about his circumstances. But perhaps I’ve got that all wrong? Perhaps I’m not giving June Allyson enough credit for representing a certain type of American woman in the 1950s credibly? I’ve a feeling that Interlude is technically efficient as a romance/melodrama but I’m not sure that Sirk and his cast and crew were fully able to exploit its potential. I would watch Brazzi in anything!